Got home and started thinking about it.. 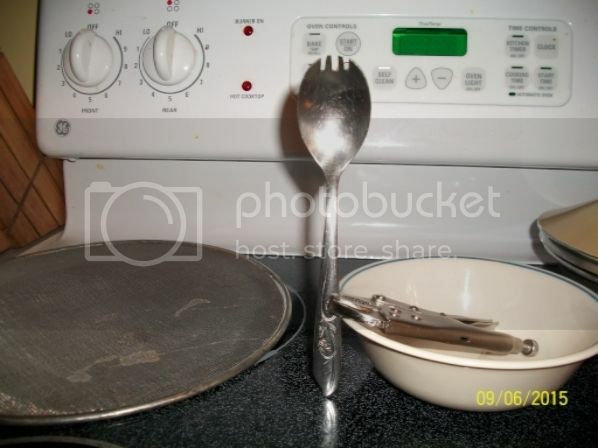 Looked up sporks on the internet, both sturdy plastic and metal ones can be found..... For a price.. Seems anywhere from about $8 $20..... Not going to happen, so I made my own..
Actually it doesn't work too bad... Not what you want to eat a T bone with.. But good enough to eat several meals I fixed on my Hobo stove.. Several cans of Campbells Chunky soup out of the can and other things "C" ration or MRE type packs.. I'm going to make up several more and stash one in each of my vehicle kits, and where ever else I might need one.. It may seem a little Jack Pine Savage/hillbilly/redneck to make your own, but give it a try... It might turn out pretty handy.. Colonel Sanders would be proud of you. That's a fine job you did there - looks down right store bought! I always keep a spoon in my gear. In fact, I'm the proud owner of a titanium spork that one of my sons gave me. I have come to prefer my "Light My Fire" spoon/fork because I like having a real spoon -- I was always frustrated trying to get all the KFC imitation mashed potatoes out of the little Styrofoam cup. I try to carry plastic spoon with me in my bag. I save them from picnic trips and wash and put in . I checked my bag this morning none in it. Need to put a set in in case. Guess I took out on that back country trip. DIL had not put in any spoons. I had some for us. Guess I washed and re-bagged and did not put back. In cupboard I guess. Have not seen sporks but have ice cream fork/spoons. Salad fork I did carry. That is short. I'll never forget sitting in my truck a long way from anywhere having my lunch when I realized I had no spoon for my yogurt. What a mess!